In March of 2011 I talked with Catherine Denueve following a screening of François Ozon’s comedy Potiche. The screening was for members of the National Board of Review. Denueve spoke about her pleasure of working with the young director, pairing up against the legendary Gérard Depardieu, and her continued love of acting. She was as graceful and beautiful as one would expect from an icon of modern cinema. The review originally appeared here on the web site of the National Board of Review. Potiche literally means a large impressive looking vase that is displayed to the owner’s benefit. Another definition, referred to in François Ozon’s latest film, is a “Trophy Wife”–a beautiful woman (or man as the case may be) who paid for and displayed to the husband’s (or wife’s) benefit. Catherine Denueve play Suzanne Pujol, the wife of a rich and unpleasant factory owner who has become, in her own words, “The Queen of kitchen appliances.” Ms. Denueve has filled world cinema with some of the most memorable roles of the last 45 year–as the troubled Severine in Louis Bunuel’s Belle de Jour, as the psychologically tormented Carole in Roman Polanski’s Repulsion, as Caroline Steiner, the wife of a Jewish theater owner in Nazi occupied France who falls in love with an actor played by Gérard Depardieu in François Truffaut’s The Last Metro. Potiche is the second film in which she has worked with Ozon, previously starring with an all-star ensemble cast in 2002’s Eight Women. Potiche is an extremely enjoyable film that relies on carefully developed style, adept comic pacing, and the kind of character based humor that could fall flat if not done in the hands of a director capable of pulling it off. 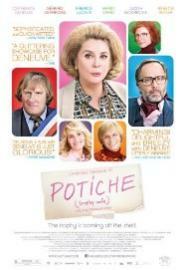 Potiche is a surprising departure for Ozon, who’s most memorable work has dramatic gravity that is anything but comic. Swimming Pool (2003) is a suspense film about a mystery writer (Charlotte Rampling) who leaves England to vacation at her editor’s French countryside cottage. A sudden visitor pulls her away from her work and ultimately draws her into a world of deception that might lead to murder. Hideaway (2009) tells the story of a young woman who loses her lover to a drug overdose then must struggle with the pregnancy she has been left alone to confront. Potiche feels like a new direction for Ozon, yet from start to finish it is accomplished, engaging, and a great deal of fun. The characters seem to have a strong resemblance to the good humored and playful ones in Truffaut’s lighter films (Day for Night, Jules and Jim) and the style of the film is just as colorful and intelligently created as in the recent work of Pedro Almodóvar. Suzanne Pujol (Denueve) lives in a stately home on a massive estate with Robert her domineering husband, who is played with energy and anxiety by the veteran Fabrice Luchini (The Girl from Monaco, Paris). Her daughter Joelle (Judith Godréche) openly makes fun of her and her son Laurent (Jérémie Renier) is completely aimless in life. Suzanne spends her days jogging through the forest in fashionable running outfits and curlers in her hair, writing small poems about the nice and sometimes naughty animals she encounters along the way. But politics bring change, the workers at one of Robert’s factories have had enough and kidnap her husband. This event sets off a series of comic situations, including the reappearance in her life of Babin, a union leader played by Gérard Depardieu. Things roll forward in the best tradition of screwball comedies, Suzanne steps up to unexpectedly fill a power vacuum when she takes over for her ailing husband, surprising past relationships between her and Babin are explored, alliances are formed (the conservative Joelle with her father, the more liberal Laurent with his mom), and Suzanne surprises everyone, including herself, with her success at the factory. Not surprisingly, her husband is unwilling to cede his position of power and Suzanne must once again fight for her equality and well-earned success. Potiche is an adaptation of a “Boulevard Play” by Pierre Barillet and Jean-Pierre Grédy (Cactus Flower), in which Ozon has reworked a farce by expanding the story and setting the action in a time (1977) that give distance to the political aspects of the tale and also allows him to have fun with the sounds and images of the era. What seems a simple life becomes anything but for characters who are not looking for change but must react when it is forced upon them. in adapting the play into a successful and funny screenplay Ozon has put his own stamp on the story by adding a completely new third act that flows from Suzanne’s experience at the factory and ultimately leads to a greater challenge for her – and possibly even greater success. The acting style is comic but not manic–there is a restraint to even the most determined character–Luchini’s Robert is crazed but still in control–that lends a feeling of professionalism to the film. The actors are working with each other–not at each other. The moments when Denueve and Depardieu, who have appeared together many times before, are on screen feel like a reunion of old friends. The script, and the directing, plays this up in an intelligent way. It’s not enough that they meet about trying to solve the politics of the factor–it turns out there was a long ago instant of passion that neither have forgotten (and a comic revelation when we later discover which one is unable to let go of the past). This is a melancholy romance between Suzanne and Babin that feels both inevitable and impossible. Ozon creates a very stylized dance scene with them at the same sleazy nightclub her husband takes his mistresses to–they look at the camera, recreate dance moves from the 1970’s as strobes sparkle and pseudo Bee-Gee’s music plays, and demonstrate a passion for the moment–and for each other–that lights up the screen. Potiche is a playful and funny film that never-the-less has a lot to say about the roles of women in politics, the home, and the workplace. Catherine Denueve is a pleasure as the trophy wife who could not be kept in the glass case–her acting is restrained but funny, and filled with knowing glances and perfectly timed reactions to the madness that circles around her. She dances, she sings, and is supported by a talented cast that help make Ozon’s latest film one of his best works to date–and a must-see if you like intelligent and romantic comedy. This entry was posted in Film Reviews and tagged Catherine Denueve, François Ozon, Gérard Depardieu, Potiche by Thomas W. Campbell. Bookmark the permalink.